Registrations for each work are noted in the CD booklet. The Music Dieterich Buxtehude’s Praeludium in D and the Chorale Fantasia on “Nun komm der Heiden Heiland” (Savior of the Nations Come) by his pupil Nicolaus Bruhns represent the two most common treatments of the organ by North German organists-composers. The Praeludium is a multi-sectional piece in which relatively free rhapsodic material alternates with metrically stricter passages. The registration is based on elements of the organ’s plenum (i.e. the ensemble of principal stops) with the hands usually playing together on the same keyboard. In the Chorale Fantasia the two hands are primarily playing on different keyboards with various solo colors being contrasted with quieter more accompanimental sounds. Each of the four sections of the Fantasia is based on a different phrase of the chorale. The Pastorale is unique among Bach’s organ works. The first movement has some of the earmarks of earlier Italian pastorales, especially the musette-like drone bass, but the other three movements resemble more closely the movements of a harpsichord suite. The fourth movement, especially reminiscent of the gigues found in Bach’s suites and partitas, has a fugal treatment of its theme in both the A and B sections with the theme inverted for B. While it is relatively certain that Bach composed all of the movements it is unclear whether he himself grouped them together into a suite as they have been traditionally performed. The Prelude and Fugue in B Minor “pro organo pleno” (i.e., for the full organ) is one of Bach’s mature works in this genre. Evidence points to the work’s being composed during the composer’s Leipzig years 1723-1750. The Prelude is notable for its appoggiatura chords (strong-beat dissonances that resolve on a weaker beat), chromatic harmonies, and sweeping scale figures. One can also note here some subtle hints of the “storm and stress” that we associate with the music of Bach’s son Carl Philipp Emanuel. The subject of the Fugue is quite simple and reserved, as is typical for Bach in his later years, but the fugue itself is one of his most powerful and profound. A new countersubject that Bach introduces about two-thirds of the way through the movement dominates the end of the fugue. Most of Johannes Brahms’ organ music is in a rather serious and melancholy vein. The Eleven Chorale Preludes were his last compositions, written in 1896, the year before he died and the year in which his dear friend Clara Schumann died. Most of the chorales in the collection are focused in some way on the hereafter. The text of “Herzlich tut mich verlangen” (My heart is filled with longing) speaks of being surrounded on earth by sorrow and woe and longing for a blessed end and eternal joy. “Herzlich tut mich erfreuen” (My heart is filled with joy), the most cheerful of the eleven, speaks of being uplifted by the beautiful summertime when God renews all creation for eternity and all creatures become glorious and pure. In these settings Brahms is able to capture the moods of these texts in a very special way. Brahms’ Fugue in A-flat minor was written in 1856 as one of a number of compositional exercises involving counterpoint. On first hearing one is struck by the beauty and depth of emotion in the piece. Further analysis reveals a wealth of contrapuntal intricacies as well, including diminution (twice as fast) and augmentation (twice as slow) of the subject and its inversion in various combinations, along with two different counter-subjects and their inversions. Vincent Persichetti was one of the most respected of American composers of the mid-20th century. He wrote prolifically for all media – many works for various small instrumental combinations in addition to his highly regarded works for band, orchestra, and piano. The Sonata for Organ, written on commission from the St. Louis Chapter of the American Guild of Organists and premiered in 1960, is one of ten works for the organ. Persichetti’s linear style is well suited to the organ, and he wrote very idiomatically for the instrument, having been an accomplished keyboard player himself. The Sonata makes much use of polytonality with the melodic interval of the seventh playing a crucial role. The first movement is in a quasi-sonata form in which two playful themes are interrupted by a fortissimo outburst that serves as a sort of development. The lyrical second movement is in a song-like form with some use of quartal harmony. The final movement returns to the tonal idiom of the first; a toccata-like opening theme with sharp rhythms is contrasted with a broader and more lyrical second theme. The movement ends furioso on the full organ. The Organ Planning for a new concert organ at the University of Tennessee began in the mid-1990s when a decision was made to renovate the former Alumni Memorial Gymnasium into a multi-purpose auditorium. The firm of Richards, Fowkes & Co. was chosen by the School of Music to develop a plan for an organ to be included in the auditorium. The organ was designed by Ralph Richards and Bruce Fowkes in consultation with Professor John Brock of the UT School of Music. The plans became a reality when the University received a bequest from the estate of the late James R. Cox of Knoxville and a contract was signed with Richards, Fowkes & Co. in 2001. Installation of the organ was completed in mid-2007. The instrument fills a long-standing need for a concert organ on the University campus. It supports the study of organ in the School of Music and offers an outstanding teaching and performance venue for students, faculty, and guest artists. The organ’s visual and tonal design reflect primarily that of 17th and 18th century northern European organs, but with the inclusion of other influences that encourage the performance of music in a wide range of styles. The organ case, inspired by the 17th century organ in Middelburg, The Netherlands, is constructed of poplar and painted with faux graining to resemble rosewood. The console area is trimmed in cherry and the keys are covered with bone and ebony. The façade contains the largest tin pipes of the Great and Pedal 16' and 8' Principal stops. The Pedal division is located in the large towers on the left and right. Pipes of the Great division (first keyboard) are located immediately above the console, with the Positive (second keyboard) pipes located just above the Great. Pipes of the Swell division (third keyboard) are housed behind the Great and Positive. A few of the largest Pedal pipes stand behind the organ case on the gallery floor. The 41 stops of the organ total 2,766 pipes. John Brock is Professor Emeritus of Music at the University of Tennessee, where he continues to teach organ and harpsichord. In a career spanning longer than 40 years, he has pursued many interests involving the organ, including teaching, performance, research, writing, recording, and consulting. 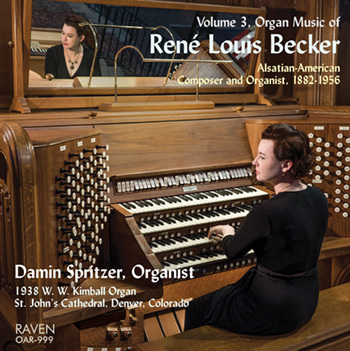 He is the author of Introduction to Organ Playing in 17th and 18th Century Style (Leupold Editions) and his recordings include two surveys of Tennessee organs and the complete organ works of Hugo Distler. John Brock graduated from the University of Alabama where he was an organ pupil of Warren Hutton. In subsequent years he developed a reputation for excellence in teaching and performance, and has performed on historic and modern organs in The Netherlands, Belgium, Germany, France, and the U.S. In 2007 he was honored by the Knoxville AGO Chapter with the creation of the Brock Organ Education Fund in recognition of his many years as chair of the chapter’s annual Church Music Workshop. Prof. Brock also continues as Assistant Organist at Knoxville’s Church of the Ascension, a position he has held since 2002. He is an active member of the American Guild of Organists, the Organ Historical Society, and the Southeastern Historical Keyboard Society. Many believe that the violins created by Antonio Stradivari in the 17th and 18th centuries will never be excelled. So it is with the King of Instruments, the pipe organ. During that same period, organs were built with sound and construction qualities that may never be surpassed. Ralph Richards and Bruce Fowkes founded their firm in 1988 in Ooltewah, Tennessee, based on the desire to bring those timeless sounds and superb mechanisms to modern listeners and players. They and their associates, a talented group of American and European craftsmen, have since been building organs according to the principles of historic European instruments.